Kittens get care, babies left to die, and women left to cry in Northam’s world. As a neonatal pediatrician, he said he knows exactly what that means. That is what convicted murderer Kermit Gosnell practiced. Comfort care is code for a baby who is never held nor even put into the neonatal unit. Instead, she dies of dehydration. It is a painful way to die. He would go to such length to save a sick kitten, but advocates leaving a vulnerable, precious baby to suffer a painful death. Ralph Northam is one sick puppy. Now he has admitted that he was part of a couple, one who appeared in black face and the other as a white hooded member of the KKK. I urge him to resign as governor —and as a doctor. While we celebrate Black History Month, we also remember that women of color are at highest risk of abortion. There is nothing more racist than killing their children. Abortion practitioners open clinics in poor communities that often border on college campuses. Northam, like abortion providers, tells us it is for mothers whose children have a poor diagnosis. Not always, but let’s talk about that. Abortion providers and advocates describe these children with minor to severe disabilities as “gross fetal anomalies.” As someone who has worked for passage of the Americans with Disabilities Act, and whose mom majored in special education, I celebrate the lives of children and adults who inspire us and enrich our world. For those with no hope for a child to live more than a few hours, we must ask why rush to terminate their lives when so many parents cherish every moment of a child in NICU? Few women are as inspirational as Jeannie French who learned that one of the twins she was carrying was diagnosed as anencephalic. She did everything possible to save her daughter. While Mary died, Jeannie learned on the day that she was buried that two other babies lived after her organs were donated. That would never have happened if Jeannie had a selective reduction to terminate Mary early. Her twin brother Will, whose doctors predicted would be at risk if Jeannie didn’t abort Mary, now towers over his mother. But we must also remember many other women or teens that have a late-term abortion. I have heard the stories whispered to me by those who didn’t want an abortion. They were coerced by their parents, boyfriends, and husbands. It is not “rare.” According to the Center for Disease Control, late-term abortions are performed on women terminating the lives of 13,000 tiny victims times a year. These women and teens facing difficult pregnancies need to know that they are not alone. Perfect strangers volunteering in 3,000 pregnancy resource centers are there to help. Woman of all ages can also find help to work, live, love and learn better at WomenDeserveBetter.com. And if she feels she cannot parent, there are parents eager to adopt babies, including those with physical and intellectual disabilities, even those with a perinatal diagnosis. And what about the baby? What are late-term abortion options? The baby may be chemically burned, dismembered, or partially born and killed. And should a part of the baby be left behind, it can seriously harm or even kill the woman. There are abortion survivors like former Feminist for Life speaker Melissa Ohden, who learned that she had been left for dead in a hospital closet. Her mother had been coerced into an abortion while in college. She was five months pregnant. Melissa deserved better, and her mother deserved better too. But if it was up to people like LeRoy Carhart, who performs late-term abortions near an upscale mall Maryland, and legislators in New York, Rhode Island, and Virginia, Melissa would not have made it, and her beautiful children would have never be born. 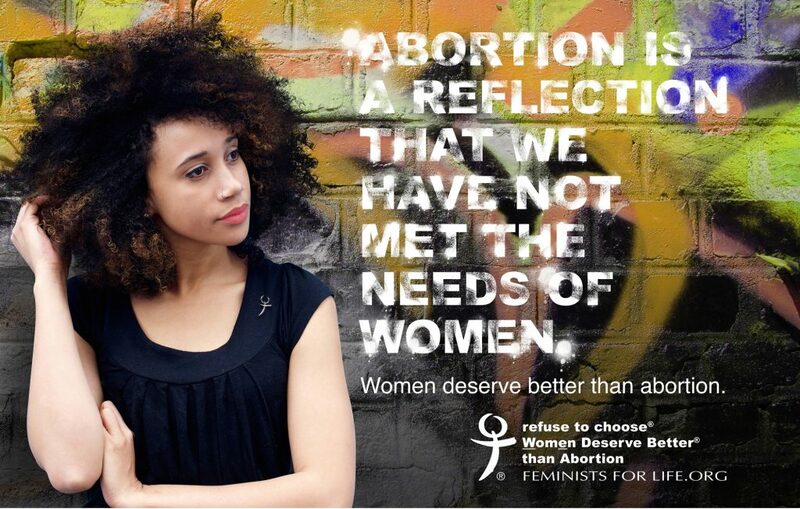 As Feminists for Life, we reject racism and abortion. We reject violence and discrimination against children with a poor diagnosis. 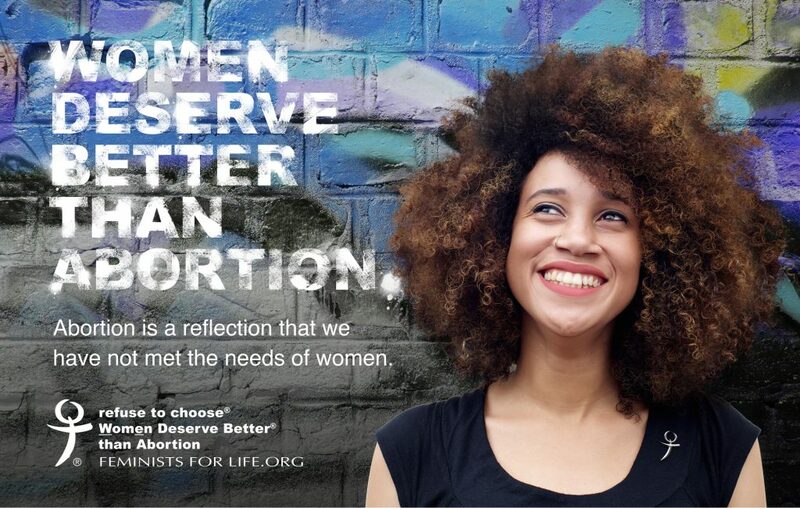 We reject the poverty that drives women to abortion. Instead, we seek holistic, woman-centered solutions. As Feminist for Life we say to women you deserve better. And you, as a mother, have a strength that you may never have known to defend your child. Don’t settle for less.